It’s an issue that divides people, obviously, but my own position is clear. After a sojourn in Limerick prison back in late 2003 and early 2004 for anti-war activism, I spent some time highlighting that jail’s exploitative labour practices in media articles and radio interviews and brought a case through the state’s Employment Appeals Tribunal. My basic point was that it is simply wrong in principle to exploit anybody’s labour, but, in addition, it discourages prisoners from viewing paid employment as a sensible option when they exit the prison system. The concept of rehabilitation is undermined. The state sent a squad of lawyers to the tribunal to ensure I lost the case – which I did – and media interest evaporated within a few months of that. Nonetheless, I was glad that I raised my voice. Aside from the labour issue, conditions in Limerick prison were inhumane at the time. Toilet facilities, for example, were Dickensian on most wings – we each had a pot in the corner and slopped out every morning – and the nineteenth-century cell I shared for a time in D-Wing was missing the glass in its windows, smashed by previous occupants to allow air to circulate, but not much fun as the weather turned bitterly cold over Christmas and New Year. In the latter case, it didn’t help that my large, somewhat demented cellmate – on remand for a brutal murder – was eating Es like they were Smarties. There are those who think convicted prisoners should suffer every inconvenience and indignity. I’m not one of them. If you want people to behave decently, it helps if you treat them decently. 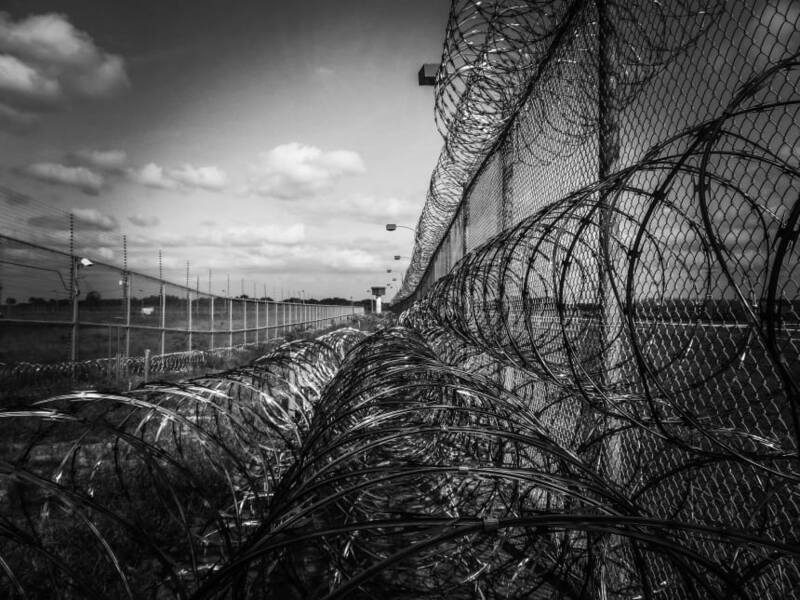 Those sent to prison are denied freedom of movement, a deeply unpleasant experience. Imprisonment is the sentence. Maltreatment and exploitation are not. More info: My brief campaign was reported in the following article by Harry Browne (https://magill.ie/archive/no-pay-chain-gang) which was published in Magill magazine in 2005. If there is such a thing as an ordinary prisoner, Fintan Lane wasn’t it. A respected historian and quiet-spoken anti-war activist, he spent 45 days in Limerick jail, including Christmas 2003, after he refused to pay a fine for his role in a peaceful mass trespass at Shannon Airport. He did his time and doesn’t like any fuss made about how hard it was, or the differences between him and his cellmates. After he was released in early 2004, he launched a legal case that, if successful, would have profound implications for those left inside and thousands of others who have served sentences in this State. His own sentence started like anyone else’s. Soon after he went in, Lane was invited to work. He reckoned being in the prison kitchen would help pass the time. He discovered that, with a wage of about 5c per hour, passing the time was about all it was worth. Lane says he had reckoned slave labour was a thing of the past, but adds wryly that “the prison environment was hardly conducive to a labour dispute”. When he got out, he approached the Cork-based Independent Workers Union (IWU), of which he was already a member. Its general secretary, Noel Murphy, was happy to take the case, and soon the IWU wrote to the governor of Limerick prison requesting a cheque for €1,978.58 – for Lane’s labour at minimum wage, minus what he’d already got in vouchers. 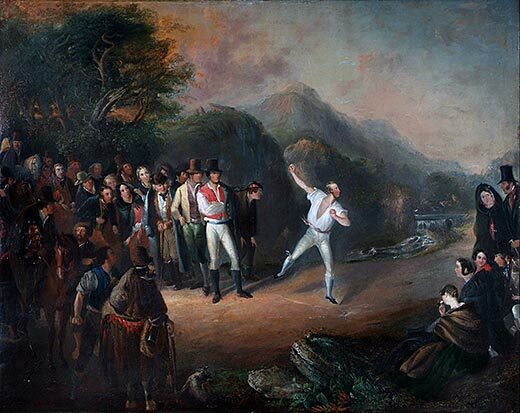 When the union’s Connaught regional secretary, Gerry Corbett, began researching the case, taking a barrister’s advice, he found Lane’s claim looked very strong. The National Minimum Wage Act 2000 makes specific exemptions for apprentices, gardaí and members of the Defence Forces, but not for prisoners. And while there’s not much relevant Irish case-law, the precedent and the labour statutes seemed to suggest that Lane, like other prison-workers, met the legal definition of “employee”. The prison governor, of course, didn’t agree. The first legal port of call for the case, a Labour Rights Commissioner in Limerick, backed the governor. Lane and the IWU appealed the case to the next stage, the Employment Appeals Tribunal, which heard it last month and is expected to rule in the next few weeks. However it decides, the dispute is likely to continue in the courts. The IWU’s Corbett is optimistic. “As far as we’re concerned, we can’t lose on this,” he says. Although it is complex, the case ironically turns, Corbett says, on the fact that Lane was not required to work in jail. 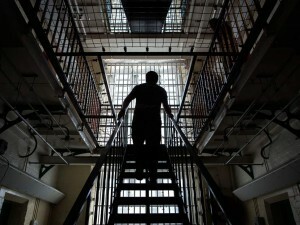 Unlike in England, sub-minimum-wage work is not “part and parcel of being a prisoner” in Ireland. “When Fintan went into jail, he had options,” Corbett says. “He could sit there and scratch his arse or he could take up work, for which he was told there was remuneration (though not how small it was). When asked if he wanted to work, he agreed. If he chose not to work, nothing would be done to him. In choosing to take up the option, he entered a verbal contract of employment.” And that, the IWU submits, makes Lane and the prison subject to all the relevant labour laws, including minimum wage. There appears to be no international standard practice or European law on this matter. While English prisoners must work for very low pay, those in Sweden, for example, get minimum wage, Corbett says. The US, she says, “has a higher proportion of its population in prison than any society in the history of the world” – and part of the reason is what she and other activists call “the prison-industrial complex”. Prisoners work for anything from nothing to just over a dollar an hour, “and it’s not just making licence plates like you see in the movies”, Lucas says. “They’re operating call centres, or they’re making paper cups for McDonald’s and Starbucks. “Companies can get cheaper labour in prisons than they do by outsourcing to the developing world,” she says. What’s more, prison-made products can be labelled “Made in the USA.” Prison work has little or no regulation, but has apparent constitutional protection: the amendment that “banned slavery” in 1865 explicitly states it is permissible “as a punishment for crime”. While the situation here is neither as brutal nor as legally invulnerable as in the US, Fintan Lane says it should still be of concern both to workers and the wider society. “The truth is that if prisoners didn’t do the work in the kitchens, for instance, outside caterers would have to be brought in and paid the proper rates. 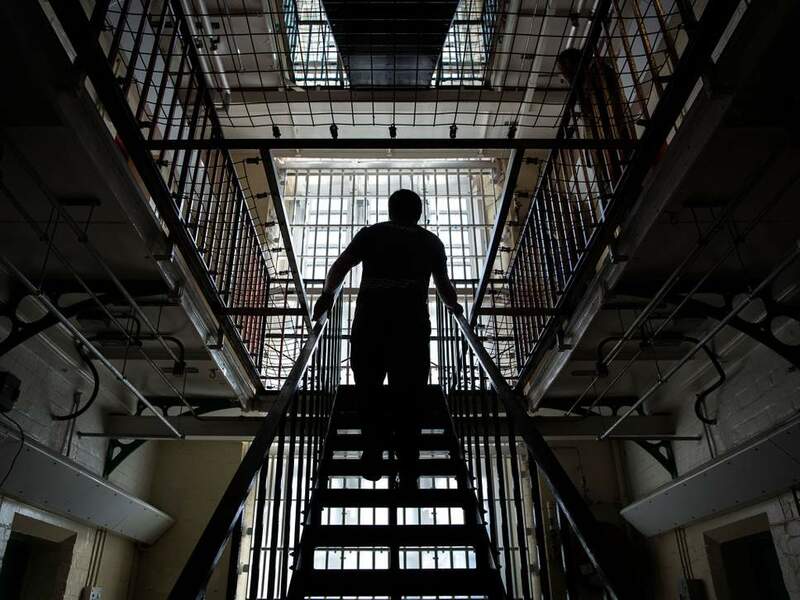 The argument put forward by the State, of course, is that it assists in the rehabilitation of offenders, but how can the exploitation of their labour possibly help? 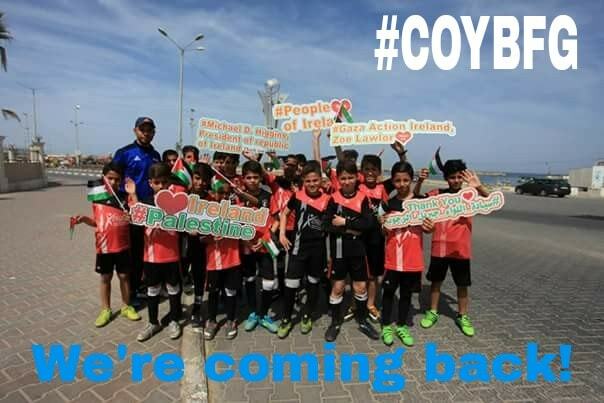 During the past two summers, Gaza Kids to Ireland – a project initiated by Gaza Action Ireland – has brought a team of young kids from the besieged, war-torn Palestinian enclave of Gaza to visit Ireland for a couple of weeks to travel around, enjoying the fresh air and playing an informal soccer tournament against local teen teams. These visits have been a tremendous success and the kids have loved (almost) every minute of their time here! They’re coming again in 2018. Due to delays, it will now be mid to late August when they arrive, but they are coming. However, some funds are still required, so please consider making a donation, no matter how small (or large), to help with costs. 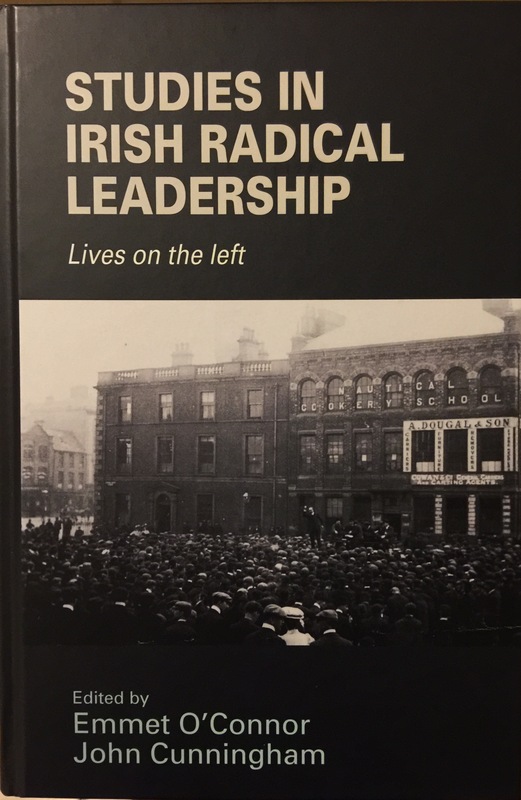 Manchester University Press has just published a collection of biographical essays on Irish radicals - Studies in Irish Radical Leadership: Lives on the Left - edited by John Cunningham and Emmet O’Connor. 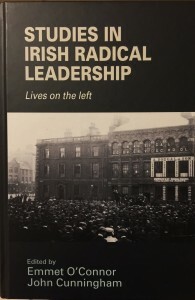 Reminiscent of John W. Boyle’s Leaders and Workers, which appeared in the 1960s, this volume covers a cross-section of radical political and labour leaders, some almost entirely forgotten, from the early nineteenth century to the 1990s. The hardback is a bit on the expensive side, but you could perhaps ask your local library to stock a copy. 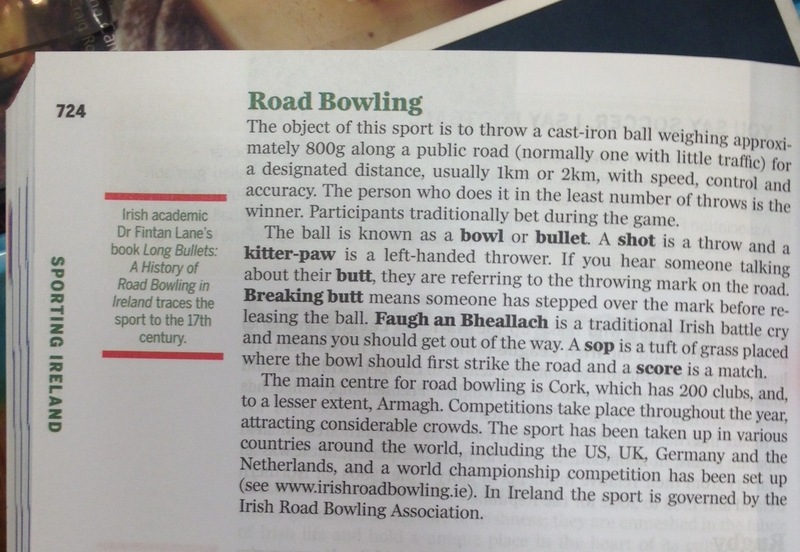 The current edition of the Lonely Planet Guide to Ireland has retained a very decent blurb on the Irish sport of road bowling and highlights Fintan Lane’s book Long Bullets (2005) for those who want to read some more about the history of this unusual pastime. It appears that the past few editions of Lonely Planet have done likewise…mmh, too bad the book is currently out-of-print. Still. Time for a reprint, perhaps! 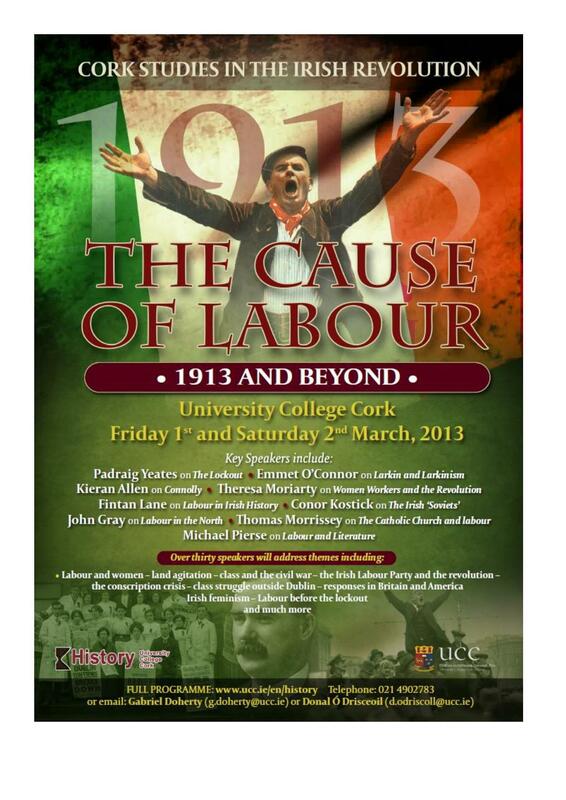 A conference will be held in University College, Cork on 1-2 March to discuss the role of the working class and the labour movement during the Irish revolutionary period, 1913-1923. Among the scheduled papers is ’The lessons of history: James Connolly and Irish historiography’ by Fintan Lane. Should be a very interesting two days – a good mix of research students and established scholars! Welcome to www.fintanlane.com. This website is still under construction, but most pages have now been populated. shorter articles and book reviews by Fintan Lane, click here. 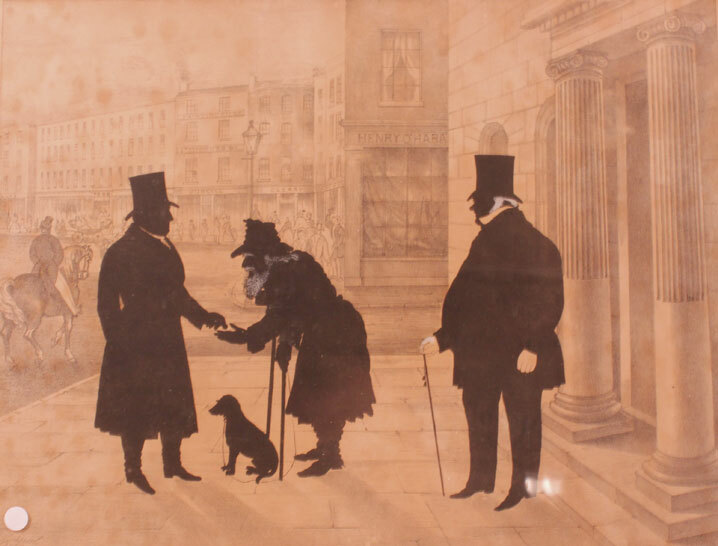 Early nineteenth-century silhouette of scene on Patrick Street, Cork.